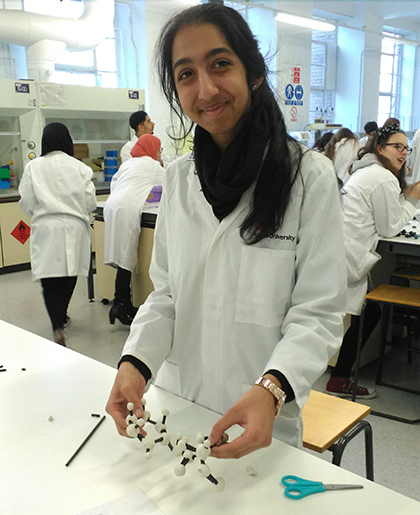 Chemistry students at The Sixth Form College, Solihull visited Aston University for a Pharmacy masterclass last week. The A level Chemistry students enjoyed a tour of the campus and participated in a series of practical activities. This included building structurally stable models of penicillin molecules. They also enjoyed a demonstration of a lab model of how drugs are absorbed and excreted within the digestive system. The students used the state-of-the art Chemistry laboratories to see how gel beads are used in the stabilisation of drug molecules in order to assist with successful delivery of medication within the human body. Last year, 39 students applied to study Pharmacy degrees at university. Chemistry, and often Biology, are essential courses for those students who want to study Pharmacy at university. A level Chemistry and Biology are two of four Science courses offered at the College – A levels Physics and BTEC Extended Diploma in Applied Science are also offered.